The... " 'Jail-break Kagekiyo' (rō-yaburi no Kagekiyo) [is] quintessentially a 'rough' (aragoto) role." The jail-break scene was the origin for the later kabuki play Kagekiyo which is still performed today as one of the 'Eighteen Great Hits' ('kabuki jūhachi-ban') "Kagekiyo, a surviving retainer of the Taira clan, has been imprisoned in Kamakura by the enemy Minamoto clan. When the Minamoto general Shigetada also captures Kagekiyo's wife, Akoya, and daughter Hitomaru, and subjects them to torture, he breaks out of prison in fury." 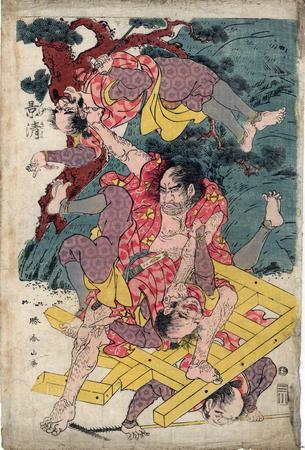 Since the artist Shunzan died in 1793, this image must have been published before that. However, the publisher, Mikawa, stayed in business until 1828 and they owned the blocks. Therefore, it is possible, that this print was produced posthumously, but no one can know for sure at this point. Source and quote from: The Dawn of the Floating World - 1650-1765: Early Ukiyo-e Treasures from the Museum of Fine Arts, Boston, p. 241. The print bears the 'kiwame' seal and therefore postdates 1791.